"...a must for a clean dry boat..."
You need to see the full cover to fully appreciate the attention to detail and craftsman ship given to this cover. The rugged Acqualaun cover is designed for extended travel and storage. High wear areas have been heavily reinforced. The front and back ends feature button snaps (front) and buckets (rear) allowing the cover to fold around the trailer winch stand and bow eye and (rear) anchor bracket. 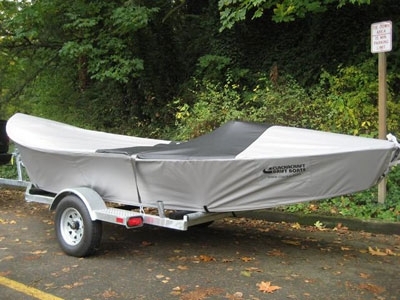 This eliminates the need to install the cover before completely winching the drift boat onto the trailer. There are also multiple buckled straps and draw strings to tightly draw the cover completely around the boat. During rainy weather, the cover is a must for a clean dry boat when you arrive at your destination.